Although some herbalists consider Alfalfa so mild that it is a food rather than a supplement, the herb has to its credit some wonderful cures. Frank Bower (who is known as the Father of Alfalfa) discovered that the plant contained important enzymes, which assist in good digestion. Tests over a period of years revealed that in addition to enzymes, the plant contains important chlorophyll, vitamins and minerals, all of which stimulate the appetite. The enzymes are sufficiently present to help in the digestion of all four classes of foods--proteins, fats, starches and sugars. The high Vitamin A content in the plant is excellent to support the aid in the body's natural ability to fight infection. Warnings: Keep out of the reach of children. Store in a cool, dry place. Notes: Used in disease prevention, for black and blue welts, for anemia, ulcer treatment, urinary disorders, peptic ulcers, gastric and duodenal ulcers, for bladder and prostate problems, for lumbago, to retard tooth decay, as a diuretic, for dropsy, helps clot blood in hemorrhages, for high blood pressure, pregnancy, to increase quality of mothers milk, for jaundice, malnutrition, to lower cholesterol, for arthritis, rheumatism, colitis, wounds and to help alcoholics and drug addicts. After extensive research, we can assure you that only the finest quality herbs, harvested in the optimum season are used for Dr. Christopher's Single Herb Line. 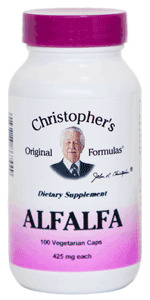 All Dr. Christopher's capsules are encapsulated in an all vegetarian capsule, free from any animal by products. Recommended Use: As a dietary supplement take 2 capsules before each meal with 12 oz of water or as prescribed by your health care professional.